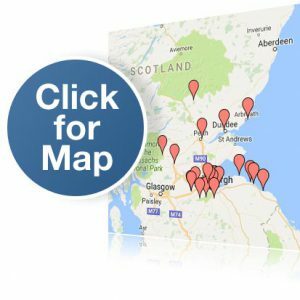 You can download PDF versions of these leaflets for free from the links below, or by opening the interactive map on the right. The leaflets are handy to have for reference on your phone or tablet when you are visiting the sites. Where printed versions are available, you can order these within the UK for a nominal charge to cover postage. 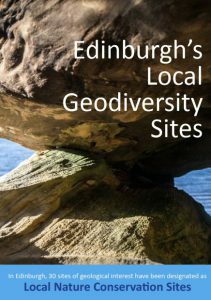 In Edinburgh, 20 sites of local geological interest have been designated as Local Nature Conservation Sites by City of Edinburgh Council in partnership with Lothian and Borders GeoConservation and included in the City Local Development Plan. Edinburgh Castle Rock developed as part of a volcano hundreds of millions of years before human occupation. Today it provides a spectacular backdrop to the centre of the City of Edinburgh. This booklet describes the geological processes which created the landscape of the city centre and a selection of stone-constructed buildings and monuments which form part of the city’s built heritage. Auchinoon Brae is a prominent feature of the A70 road about 12 miles east of Edinburgh, and affords a beautiful vantage point to the Pentland Hills. Published by West Lothian Council. Guide to the fossils found along the shore at Barns Ness, near Dunbar in East Lothian. Binny Craig, West Lothian – A prominent landmark, and an example of landform shaping , a legacy from the last Ice Age. This is a crag and tail landform with many surrounding features associated with glacial retreat. Published by West Lothian Council. Blackford Hill is one of Edinburgh’s Seven Hills. It is a Local Nature Reserve, the site of the Royal Observatory and a great vantage point. 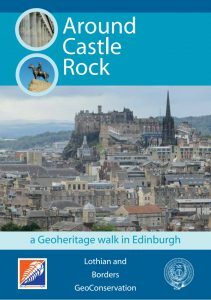 The geology walk described in this leaflet follows a circular route around Blackford Hill, through the Hermitage of Braid and to the summit of the hill, taking in important geological sites including Agassiz Rock. The Building Stones of Edinburgh’s South Side. A walking tour of 38 buildings, walls and monuments of central Edinburgh, from George Square through the old town to the High Street. Calton Hill, central Edinburgh – A fragment of the Arthur’s Seat volcano, just beyond the east end of Princes Street. In addition to the extensive views around the city, the leaflet pinpoints interesting buildings and monuments in the surrounding area. The Canongate Wall of the Scottish Parliament is embellished by a selection of Scottish rocks, some of which have Scottish texts carved into the face. Corstorphine Hill, west Edinburgh – this scenic site contains geology (dolerite sill with sedimentary exposures), walks with panoramic views and some archeology thrown in! Craigleith Quarry – Edinburgh’s largest quarry is mostly filled in, but this leaflet guides you to the remains of the quarry face. Cramond village is located near the mouth of the River Almond in northwest Edinburgh. The village is well known for its rich history dating back to prehistoric times. Less well known is Cramond’s geological history which has shaped the landscape we see today. Written by Lisa Randall, as an outreach project while a student in the School of GeoSciences, University of Edinburgh. What makes Dunbar special? Why was this a good place for a town? Dunbar owes its location to the local geology. Explore the rocky coastline in this 4km long coastal walk. A small, disused limestone quarry and a SSSI near Bathgate. Unusual in that the deposit favoured fossilisation of land animals rather than those that lived in water. Collecting not allowed without permission. Published by West Lothian Council. This leaflet introduces the story of coal and volcanoes, the varied rocks exposed along the River Esk and how the bedrock has been modified by ice and meltwater. Written by Nicola Coffin, as an outreach project while a student in the School of GeoSciences, University of Edinburgh. two very different stories: the original formation of the rocks during the Carboniferous Period and changes that have happened during the current Quaternary Ice Age. Written by Tom FitzPatrick, as an outreach project while a student in the School of GeoSciences, University of Edinburgh. Published by West Lothian Council. James Hutton, a man ahead of his time. James Hutton’s life (1726-1797) spanned the period of the Scottish Enlightenment and he made a considerable contribution to our understanding of Earth processes and of the immensity of ‘deep time’. Explore sites in and around Edinburgh associated with Hutton and his legacy. The rocks at Joppa Shore, Edinburgh, were laid down as soft sediment 300-320 million years ago, and include sandstone, mudstone, coal and limestone. Written by Lindsay Wilson as a final year project of her geology degree at Edinburgh University. North Berwick’s scenery is formed from a variety of volcanic rock types formed around 340 million years ago. Written by Neil van Beinum, as an outreach project while a student in the School of GeoSciences, University of Edinburgh. A guide to the volcanic rocks of the Pentland Hills. Petershill Wildlife Reserve, West Lothian – A limestone reef and a SSSI near Bathgate. This was a lime quarry in the mid 18th C, later a drinking water reservoir. Published by West Lothian Council. Siccar Point, the world’s most important geological site. James Hutton, father of modern geology, visited Siccar Point by boat in 1788, an event which led to a profound change in the way the history of the Earth was understood. St Abb’s Head is a National Nature Reserve managed by the National Trust for Scotland, with spectacular cliffs, a small loch and many nesting seabirds during the summer. The headland is formed mostly of volcanic rock, erupted about 400 million years ago. The Geology of the Water of Leith, Edinburgh. Written by Emma Skelley as a final year project of her geology degree at Edinburgh University. Guide to the Water of Leith at Redhall, Edinburgh, including local sandstone quarries. Guide to the Water of Leith at Stockbridge, Edinburgh. Witch Craig Wall, West Lothian – a viewpoint near Bathgate, constructed with representative Scottish stone, labelled and with a display panel on the landforms visible on a really good day! Published by West Lothian Council. Leaflet published by the Stirling and Clackmannan RIGS Group. Callander Geodiversity Trail – Stories in the Landscape, produced by Callander’s Countryside, an associated organisation of Callander Community Development Trust.